More Big Lunch cupcakes… well, this really is a learning curve. I now know that blue food colouring is less intense than pink. Whereas a half teaspoon of blue food colouring was only enough for a pastel blue on yesterday’s batch, today I learn that pink is less forgiving. I got over confident with the pink and so this buttercream shrieks PINK (though it looks more yucky salmon in this light). 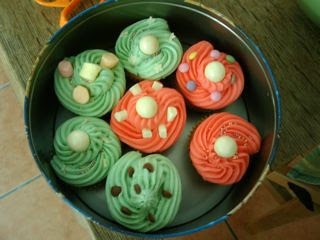 I have not documented with pictures a batch of icing which I made yesterday. I was too hard to go through the nozzle. So today I did buttercream instead and used a bigger nozzle. The effect is what you see above. I sure hope I get the hang of this soon. UPDATE: These may look gruesome but I’ll have you know they were first to disappear on the day. The colours were less “yellow” in real life – blame my mobile phone pictures.